Once in a while, Dana will stray from his normal routine of blowing production glass work. 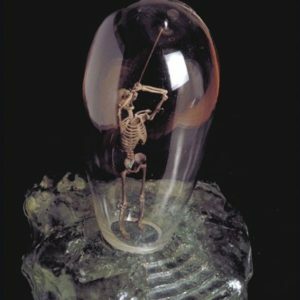 He gets excited when he can stop for a moment and work on carving waxes for his newest single edition glass and bronze sculpture. There is a great satisfaction in making these art pieces. 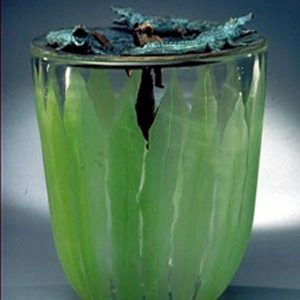 Dana loves the challenge of combining glass and bronze in unique and unusual ways. The process begins with a sketch of an idea, roughed out on paper. 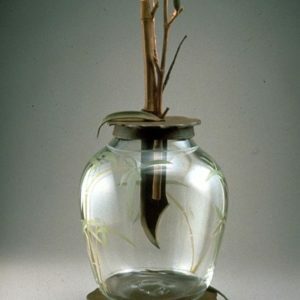 Depending on the design, the vase is created first, usually blown or cast from molten furnace glass. 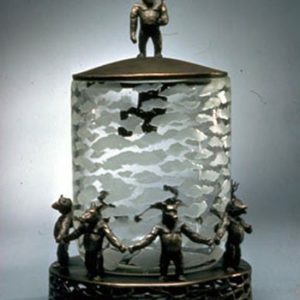 Once the glass is created, the design for the bronze artwork is then sculpted in wax. 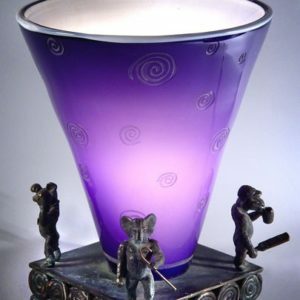 The wax is formed and shaped around the blown vessel, custom fitting the metal elements to the top and bottom of the glass. Dana does all his own sculpting of the wax for all elements and characters. 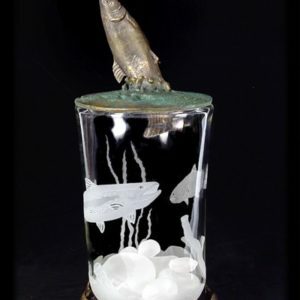 He then casts these in bronze using the lost wax method. 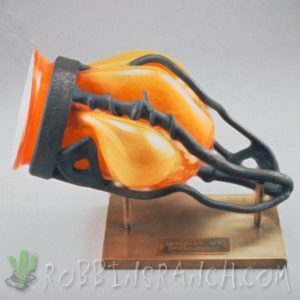 There is no mother mold created so these are all single edition sculptures. After the major elements are cast, some additional decoration is fabricated and soldered to the sculpture. 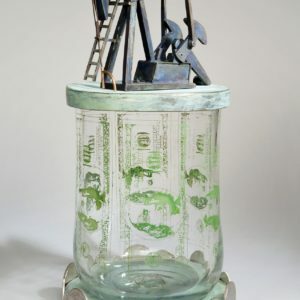 Dana likes to add finishing touches and details to the work that could not be rendered during the initial casting. He may grind and polish areas of the bronze sculpture. 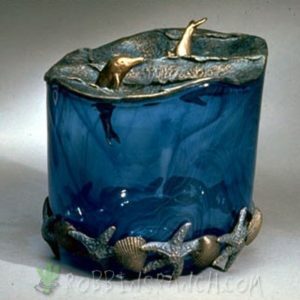 He may also patina the surface to give the metal elements accents and highlights. Once all the metalwork is completed, Dana may go back to the glass and change the surface by sandblasting on it. In order to do this, a rubber resist is adhered to the outside of the glass and a design is cut out, creating a stencil to sandblast through. He will spray sand onto the surface of the glass and when the stencil is removed a frosted design is revealed. The final imagery is then accented by adding oil paints to the glass. His table top sculpture is then complete.